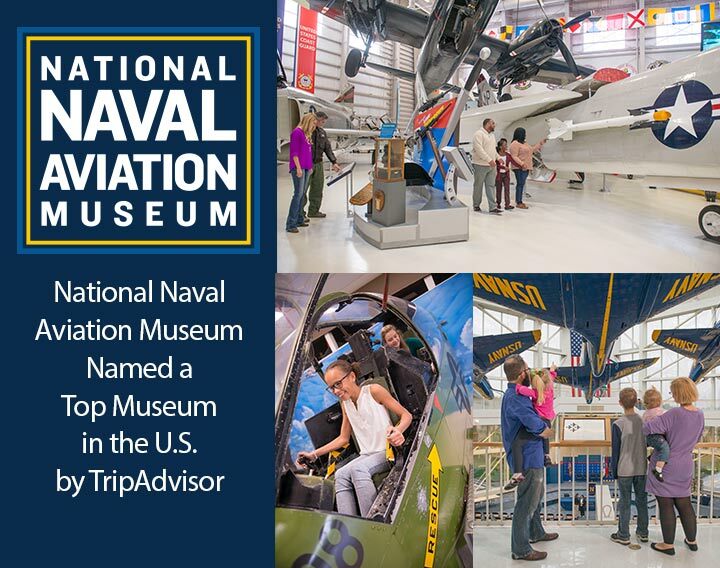 September 12, 2018 –Pensacola, Fl—TripAdvisor recently announced the 25 winners of its 2018 Travelers’ Choice Awards for museums and theNational Naval Aviation Museum (NNAM) was once again recognized as a top museum in the country. NNAM ranks 17th on the list that includes well-known museums such as the Smithsonian National Museum of Natural History, the Museum of Modern Arts, the Getty Center, the Smithsonian Air and Space Museum and more. Winners were determined using an algorithm that took into account the quantity and quality of reviews and ratings for museums worldwide, gathered over a 12-month period. TripAdvisor, which is a travel planning and booking website, has more than 350 million unique visitors each month and more than 385 million reviews and opinions covering more than 6.6 million accommodations, restaurants and attractions. “According to TripAdvisor booking data, museum ticket sales last year grew 29 percent for U.S travelers and globally, bookings increased by 40%. This year’s award winning museums serve as inspiration for travelers wanting to join the trend and discover some of the world’s finest collections of art, science, culture and history.” said Brooke Ferencsik, senior director of communications for TripAdvisor. The National Naval Aviation Museum is the world’s largest Naval Aviation museum and one of the most-visited museums in the state of Florida. Share the excitement of Naval Aviation’s rich history and see more than 150 beautifully restored aircraft representing Navy, Marine Corps and Coast Guard Aviation. Historic aircraft are displayed both inside the Museum’s nearly 350,000 square feet of exhibit space and outside on its 37-acre grounds. To see the full list of museums, click here. The National Naval Aviation Museum, one of TripAdvisor’s “Top 25 Museums in the United States,” features nearly 350,000 square feet of displays and is one of the world’s largest aviation museums. Located aboard Pensacola Naval Air Station, the facility boasts more than 150 beautifully restored aircraft representing Navy, Marine Corps and Coast Guard aviation and is one of Florida’s most visited museums. Be sure to visit Hangar Bay One, displaying aircraft of the post-WWII era including presidential helicopter, Marine One. Among the countless things to touch, see and experience are thrilling 3D and HD flight simulators and the new Blue Angels 4D Experience. Don’t miss the drama and power of the new laser-powered Giant Screen digital theater. The Cubi Bar Café offers a unique dining experience and the Flight Deck Store is the perfect place to find a souvenir that captures the spirit of Naval Aviation. Museum admission is FREE and open to the public. The National Naval Aviation Museum is open daily from 9 a.m.–5 p.m. For more information, visit www.NavalAviationMuseum.org.